7 reasons you'll LOVE us! This box has a slide-out (not glued) removable 8-compartment divider, making it versatile box for storing gifts, keepsakes, tea bags or odds and ends! We engrave these boxes here in Boise, Idaho, USA. The delightful honey color of Bamboo is produced entirely naturally, without the use of stain or paint. Have an assortment of odd little things you want to give someone? Why stuff it in boring cardboard when you can make a splash with the box itself. We've made these for bachelor parties, bridal showers, birthday gifts, wedding presents, anniversaries. 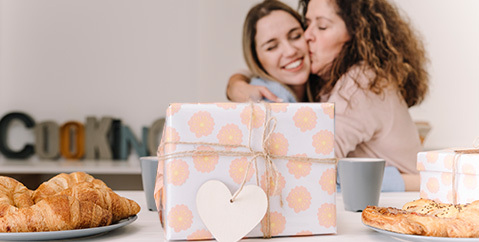 Throw them off the scent with a gift box that's much larger, sturdier and heavier than the gift they might be expecting, or use it to contain an assortment of smaller gift items. A special heating process caramelizes the sugars in the bamboo to give those characteristic tones that enhance the wood, giving that variety of shades we know and love about this product. Furthermore you need have no qualms about the depletion of our precious rain-forests! Bamboo is fast-growing, naturally replenishing grass and is one of the worlds most renewable resources. And it's tough as any hardwood too! Outside dimensions of box are 12 1/2" long. 7 5/8" wide (7 1/2 with hinge sticking out a bit in back). 3 5/8" high. Inner dimensions of each compartment are 2 3/4 inches wide and 3 1/4 inches (going back) and not quite 2 1/2 inches deep to hold the tea bags. The dividers easily slide out (not glued in) and can be sawn down to allow more oddly shaped compartments. Wipe clean with mild soap and water and dry thoroughly; rub occasionally with mineral oil to maintain optimum appearance. 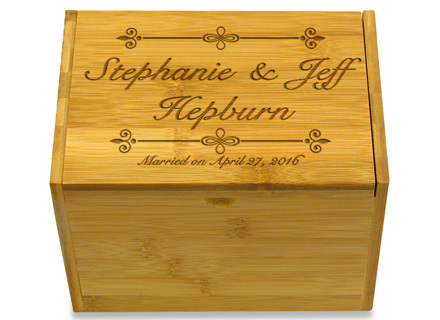 Being made from natural bamboo and engraved individually, all our organization boxes are unique. Please be aware that the box you receive and the tone of the engraving may vary from the pictures on our site. © 2019 Cookbook People. All rights reserved.